Ceramic braces, sometimes called clear braces, are a popular alternative to traditional metal braces. Though they aren’t recommended for extreme cases, your favorite Glendale orthodontist knows that ceramic braces can be a wonderful alternative for more mild cases. The idea of clear braces first became popular in the 1980s. Luckily, technological advances and product developments have changed them quite significantly from when they were first introduced so they are now stronger and better than ever! Made out of a ceramic composite, these braces no longer stain and are quite comparable to the strength of traditional metal braces. 1. It’s been said that ceramic braces don’t irritate the gums as much as traditional braces do. 2. They are designed to blend in well with the teeth; the two basic shades are a white and slightly darker off white color. 3. They are strong and don’t usually chip or break. 1. Since the rubber bands used on ceramic braces will be clear or white, they can often stain if not taken care of properly. 2. The brackets are larger and more expensive. 3. They are not recommended for extensive treatment. After reading, if you are ready to learn more about treatment options for you or your child, give our orthodontics office in Glendale, CA a call at 818.242.1173. For a limited time, we are offering a $250 savings certificate for your initial visit. We can’t wait to help you create your new, spectacular smile! This information is not meant as medical advice. It is provided solely for education. Our Glendale, CA orthodontics office would be pleased to discuss your unique circumstances and needs as they relate to these topics. 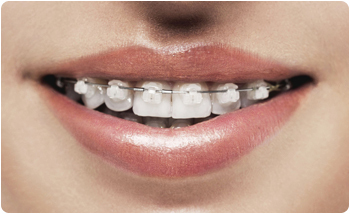 Glendale, CA’s orthodontist, Dr. Bergh specializes in braces for you and your child. He offers a variety of braces and orthodontics in our Glendale, CA orthodontics office, including clear ceramic braces, traditional braces and Invisalign. Call our Glendale orthodontics office at 818.242.1173 today for your complimentary, no-obligation consultation for braces & orthodontic treatment.